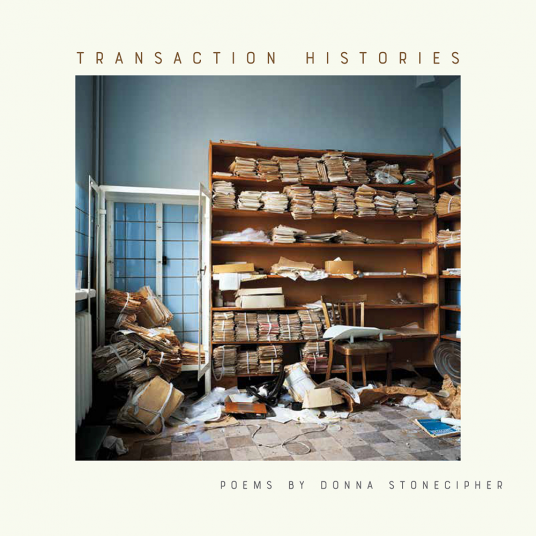 American poet and longtime resident of Berlin Donna Stonecipher’s latest collection, following The Reservoir (University of Georgia Press. 2002), Souvenir de Constantinople (Instance Press. 2007), The Cosmopolitan (Coffee House Press. 2008), Model City (Shearsman. 2015) and Prose Poetry and the City (Parlor Press, 2017), is Transaction Histories (Iowa City IA: University of Iowa Press, 2018). Reminiscent of the work of Cole Swensen for her use of the extended, single line, Transaction Histories, as the back cover offers, is a gathering of “six series of poems that explore the disobedient incongruities of aesthetics and emotions,” yet this is also a collection constructed as a single, ongoing prose sequence, pushing further and further through the possibilities of the sentence. There is something of Russell Edson’s prose-poem influence in her work (an influence I’m not entirely fond of), but one that borrows as part of an array of influence, as opposed to something replicated. Stonecipher’s prose-explorations exist more in the fluid space, it would seem, between Edson’s narratives and a more lyric strain, akin to a poet such as Cole Swensen, or even, given her focus on sentences, Lisa Robertson. The lyric elements of her sentences have the most intriguing ebb and flow, moving through her prose like water. There is a fine tension she explores as well, between “aesthetics and emotions,” moving between and among landscapes of history, vision, artwork and writing, shifting across a wide field of interpretations and responses, as well as the collisions that occur between seemingly unconnected thoughts, images and sentences. “It is not possible to map a coastline,” she writes, to open part 4 of her poem “TRANSACTION HISTORY 5,” “because the closer you zoom in, the more complexly intricate is the tracery of the coves and jetties, the sandbars all sliding off the map to be swallowed up by the great Unpredictable.” Stonecipher’s Transaction Histories explore the prose poem through multiple entry points, utilizing the building blocks of sentences to accumulate into stanzas, stanzas to accumulate into sequences, sequences to accumulate into sections, and sections to accumulate into a single, stunning, book-length work.